Melting point 198 to 202 °C (388 to 396 °F; 471 to 475 K) dec.
2,4-Dinitrophenylhydrazine (DNPH, Brady's reagent) is the chemical compound C6H3(NO2)2NHNH2. 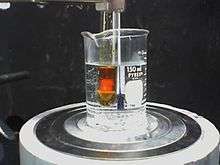 Dinitrophenylhydrazine is a red to orange solid. It is a substituted hydrazine, and is often used to qualitatively test for carbonyl groups associated with aldehydes and ketones. The hydrazone derivatives can also be used as evidence toward the identity of the original compound. The melting point of the derivative is often used, with reference to a database of values, to determine the identity of a specific carbonyl compound. It is relatively sensitive to shock and friction; it is a shock explosive so care must be taken with its use. To reduce its explosive hazard, it is usually supplied wet. ↑ Brady, O. L.; Elsmie, G. V. (1926). "The use of 2:4-dinitrophenylhydrazine as a reagent for aldehydes and ketones". Analyst. 51 (599): 77–78. Bibcode:1926Ana....51...77B. doi:10.1039/AN9265100077.